Vermont is a state in the United States. Its capital is the city of Montpelier, and its largest city is Burlington. The states that border Vermont are Massachusetts to the south, New Hampshire to the east, New York to the west, and the Canadian province of Quebec to the north. Vermont was home to the Abenaki and Iroquois Native American groups until France took control of the area when it was building colonies. Great Britain gained control after winning the French and Indian War. It is known for being one of only four states to be an independent nation before joining the United States. It was not a part of the 13 colonies and instead joined as the 14th state. 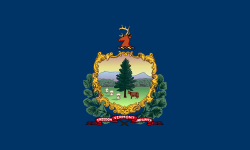 Vermont became a state in 1791. It is world-renowned for its maple syrup industry, and many tourists go to see brilliant colors the trees become in the fall months. The tourism industry has become quite successful, with many tourists coming every year. ↑ "Vermont: Population estimates". United States Census Bureau. July 1, 2017. Retrieved May 6, 2017. ↑ "Mt Mansfield Highest Point". NGS data sheet. U.S. National Geodetic Survey. http://www.ngs.noaa.gov/cgi-bin/ds_mark.prl?PidBox=AE3691. Retrieved July 20, 2015. ↑ 4.0 4.1 "Elevations and Distances in the United States". United States Geological Survey. 2001. Archived from the original on July 22, 2012. Retrieved October 24, 2011. ↑ Perkins Geology Museum, University of Vermont.